Just finished work and heading home on the bus in Istanbul, match finishes at about 1am here (3 hour time difference). No pigs in this part of the world! We owe them a pasting, but I'll settle for one nowt! 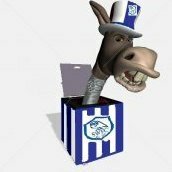 COME ON YOU BLUE AND WHITE WIZAAAAARRRRDDDDDZZZZZ UTO WAWAW OLDER, BIGGER, BETTER! Fits in reight on here then! ReCant thy foul ways and spread the word: "The Ginge is dead; Long live the Ginge!" Yes mate, the 2nd photo is my son about 4 years ago and it's still my favourite photo. Next photo is about a year and a half ago, he loves all things wednesday especially if he can wear it We live in istanbul and he is desperate to go to hillsborough these days! His name is Ahmed, named after his Turkish grandfather who is a big Trabzonspor fan. He want to score goals and have everyone sing "Ahmed champion"! His mum wants him to support Fenerbahçe, and he always says that if mum asks i like fener and Wednesday, but don't worry dad, i only like wednesday, so dont tell her! See, i even remember how John Helm pronounced Wednesday! Same for me, i definitely remember being annoyed that they cancelled the footie highlights due to the air strikes starting. Stayed up all night in the vain hope that they would realise the importance of the football highlights, so Wedenesday must have been scheduled to be on. I was also sure it was that Coventry league cup game. There is no way i would have stayed up for any other football related reason! Maybe the last 28 years have been a collective hallucination, and in reality Wednesday have recently collected their 14th champion's league title, and Saddam Hussien turned out to be a massive practical joker and hadn't invaded kuwait after all.